Art has the power to transcend your mood and state of mind. The privacy of a sleeping chamber allows for a personal touch – lead with a color and be inspired by where it takes you. Explore six different perspectives on how color can affect the mood of an interior and create beautiful spaces to dream in, In Color! 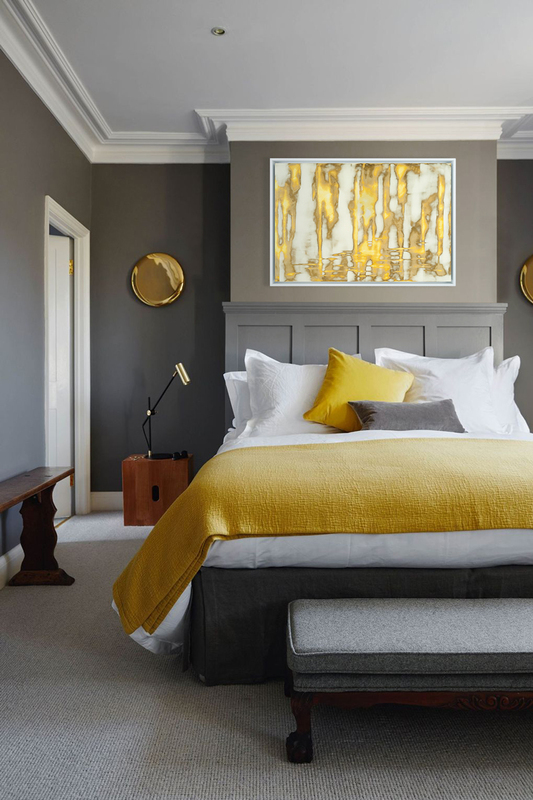 The warm golden yellows in Audra Weaser’s Charm evoke a mystical atmosphere in this serene bedroom. Softly echoing the golden accents throughout the interior, Charm‘s gleaming waterscape invites an uplifting and optimistic perspective. Audra Weaser, Charm, Mixed Media on Panel, 24 × 36 inches. Crisp, verdant greens evoke a jovial Spring-like atmosphere in this zen interior, while David Burdeny’s peaceful photograph Buddha complements the calmness in the room. The photograph, taken in Ayutthaya, Thailand, echoes the Asian influence of the bedspread below. Be inspired by travel and culture — arrange an interior that takes you abroad. 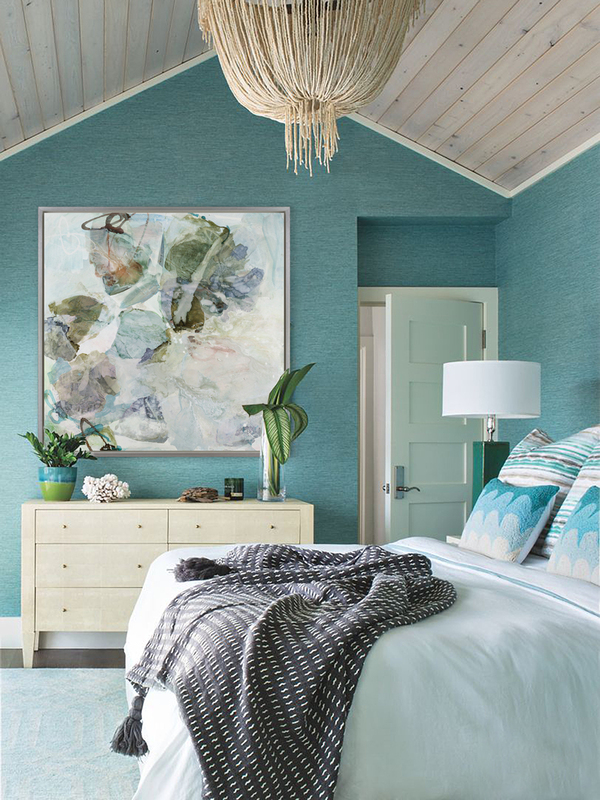 Designed with ocean-side accents, this coastal bedroom inspires a feeling of serenity. The cool blues add a sense of refreshing calmness, while Liz Leventhal’s Shore Break 1 suggest a layered, complex waterscape. Take inspiration from the ocean — Complete a soft, tranquil interior with the delicate, flowing contours of an abstract work of art. Raphaelle Seguin’s joyous portrait Aby brightens this monochromatic interior with a whimsical energy. The eclectic mix of patterns and textures in the space make way for a playful interpretation of the plum tones – The bright blue glasses give a striking contrast to the monochrome space, while the soft whites balance the shades of lavender. 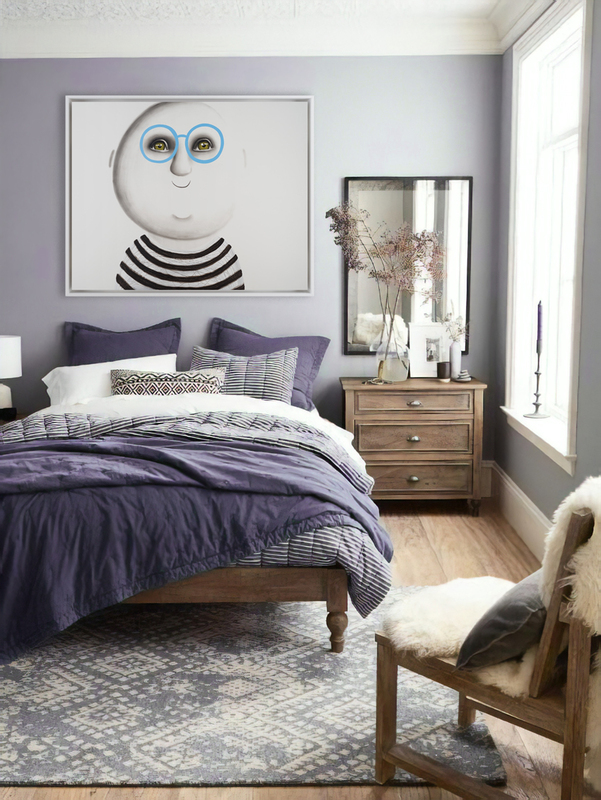 Be inspired by the tonality of a single hue and select a whimsical painting to add a playful element of surprise. 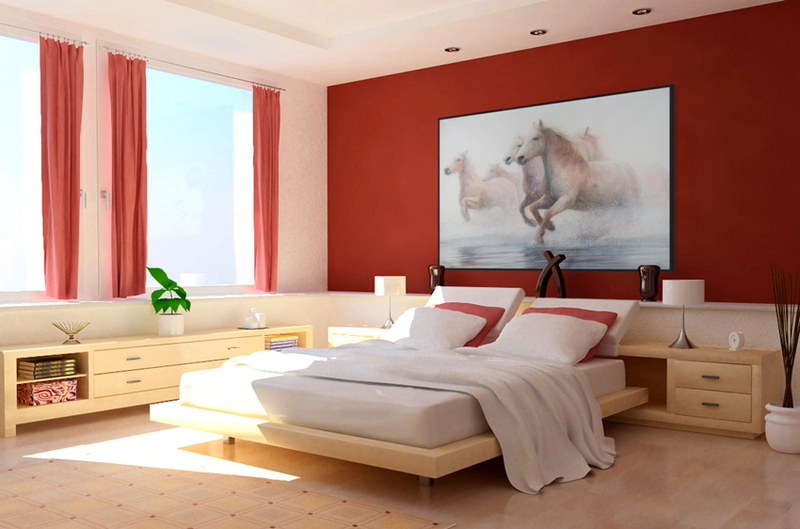 Bold, striking crimsons give this spacious bedroom an impassioned sense of dimension and complexity. Ray Hare’s mystical work Daydreaming softens the mood of the interior’s bold palette while still echoing the warm tones throughout. Arrange a bold, well-balanced interior with a work of art that complements the energy of the space. Dave Malone’s industrial, mixed-media works from the Poured series add a layer of textural dimension and energy to this warm, lush interior. 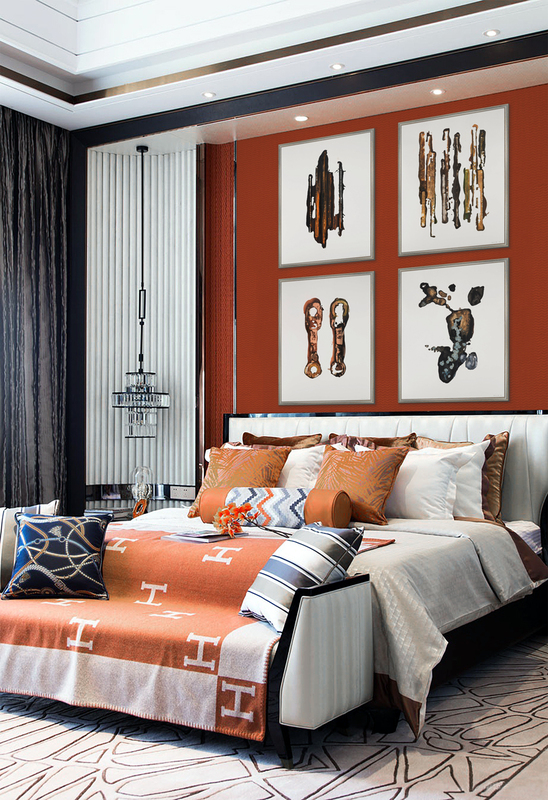 Bold persimmons unite the eclectic textures and patterns throughout, creating an exciting – yet balanced – interior. Whether designing with a bold, impassioned palette or cool seaside hues, select artwork that evokes the mood you dream about.